This weekend, serendipitously, both Mssr. BromBom and I were hanging around in the Have. Each of us intended to spend the weekend packing for our upcoming moves. However, given the 90 million degree heat, plus our shared penchant for fun, packing was foregone to make room for more inviting activities. We started off the weekend (which henceforth shall be referred to solely as "The Weekend of New Haven Revival") right by stopping by the Union League cafe for some cocktails and oysters. Afterwards, we ventured forth into the New Haven night to try out some of the new fresh made ice cream from the MooBella machine that I was really eager to taste. We went to Durfees on the Yale College campus and to the Yale-New Haven hospital, but sadly found them both to be closed and no MooBella's to be found. The next day, inspired by the previous, Brom and I got up early to go to the Wooster Square farmers' market. We purchased all kinds of delectable farm fresh items and returned home to make lunch in my backyard. 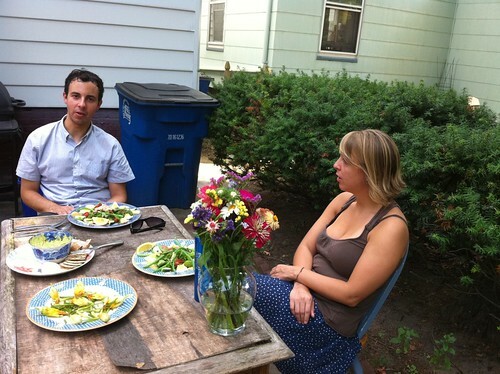 Here he is dining with Cat, another NH revivalist. For starters, I made a pesto in the VitaMix out of garlic scape from the farmers' market, basil from my "garden," shredded parm, pine nuts and walnuts. 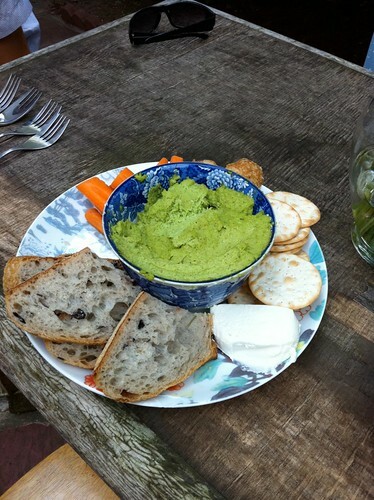 We ate it with rosemary olive bread, fresh carrots, and honey goat cheese. Soooo good. 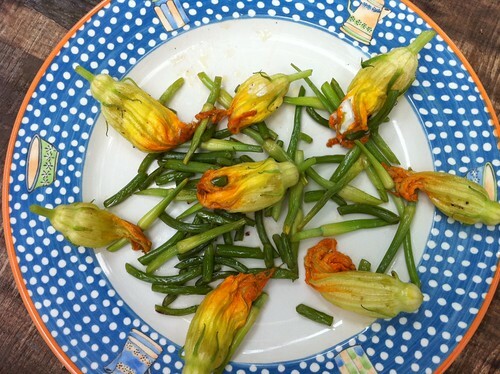 The farmers' market also had on offer one of my absolute favorite things to eat in the summer: SQUASH BLOSSOMS! These beauties came from the Yale Farm. I stuffed some with goat cheese, others with the all-purpose Siggi's plain Icelandic yogurt, and then sauteed them with some of the garlic scape. Very easy and very derishious. 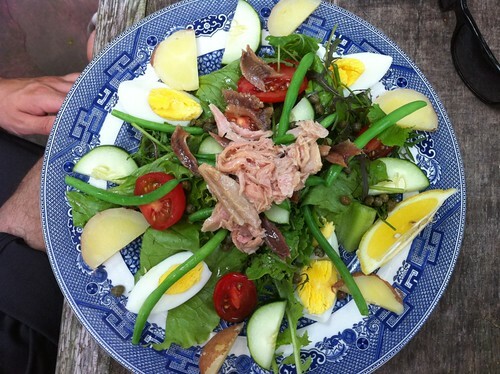 Because I had been excited by the one I had the night before at Union League, I decided to make some Nicoise salads. I have gone through periods where I eat these exclusively, and they are also one of my favorite summertime treats. 2) the machine kept malfunctioning before it spit out the ice cream. On the plus side, the texture was creamy but light and wonderful. All this running around and eating made us tired, so we took a little afternoon nap, and then reconvened with some other friends to go to The Place, which is one of the coolest seafood barbecue restaurants you will ever go to. I stuffed myself with steamed clams, corn, lobster, and catfish. So much so that it was decided I had reached the golden ratio -- consumption:body weight parity. Just one indication that "The Weekend of New Haven Revival" was aptly named. Man, lobsters are scary! 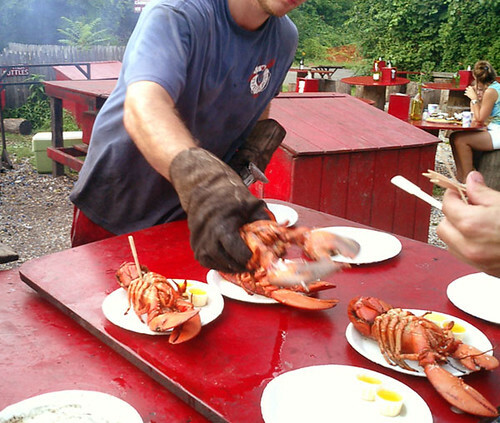 If I see one I'm gonna run and be all like , "Man that lobster tried to eat me!"